Nine years ago I started learning and seriously studying Islam. My parents listened and watched as I slowly started incorporating some of the rituals and practices into my life. They didn’t object and they didn’t try to sway me one way or another. The night before I took my shahada I called home to let them know. My mother’s only advice was, “If you’re going to become Muslim make sure you do it the right way and can do what it requires.” She didn’t tell me no. She didn’t doubt that I could do it. She recognized that it was a big decision and wanted me to take it on and do the best with it. She had watched me fast the two previous Ramadans. I wanted to make sure I would be able to fulfil this requirement, just as I began praying five times a day a few months before officially becoming Muslim. My parents weren’t scared. They had sat and listened for two years while I shared with them what I had learned – the teachings and core tenets of faith, pillars of worship, and the implications this decision would have on my life. This morning she sent me this text message. Both of my parents have since accepted Islam. This December will be my father’s 6th shahada-versary. Next August will mark six years for my mother. Looking at them, you wouldn’t be able to identify them as Muslim. My mother doesn’t wear hijab. She surprises people all the time when she offers the greeting, “as salaamu alaikum.” She’s proud of her faith. I’m also proud of my faith. It has pushed me to be more generous, to see the beauty in dressing and acting modestly, to treat my parents and family members with a higher level of respect, and to treat all people with goodness and kindness. Because of Islam I have a greater sense of peace and purpose that I didn’t have before. This morning I sat and read through a Facebook message exchange between my father and a high school friend. His friend asked why “my father’s people” would do such a thing and eventually decided that he no longer wanted to have an association with him because of his faith. I’ve received messages asking why I haven’t spoken out against the violence and tragedy that has taken place. Just because I haven’t posted a picture of the Eiffel Tower or changed my profile picture doesn’t mean that I don’t care. I believe I share a sentiment of many, a feeling of hopelessness every time something horrific like this happens. The best thing I can do is make a sincere prayer asking Allah to ease the pain of those suffering around the world and stop this from happening again. 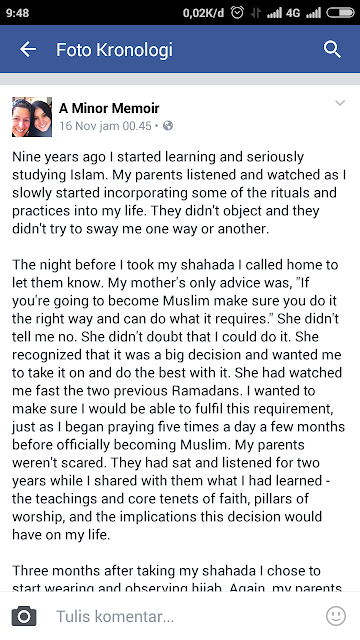 My parents weren’t afraid when I decided to become Muslim because they took the time to learn. They went out and met other Muslims and learned from their example and watched how they followed and practiced their faith. Part of my motivation for this page is to share what I find beautiful about the faith I accepted, in hopes that someone who may not know may learn and have a greater acceptance and understanding of those who practice.